The second and third floors above Sandusky Street Antiques at 30 N. Sandusky St. in downtown Delaware might not look like much now with windows missing here and there, but a local developer is working on changing that as renovations are underway to transform the vacant space into luxury lofts. Downtown Delaware will soon be adding luxury lofts to its list of offerings. 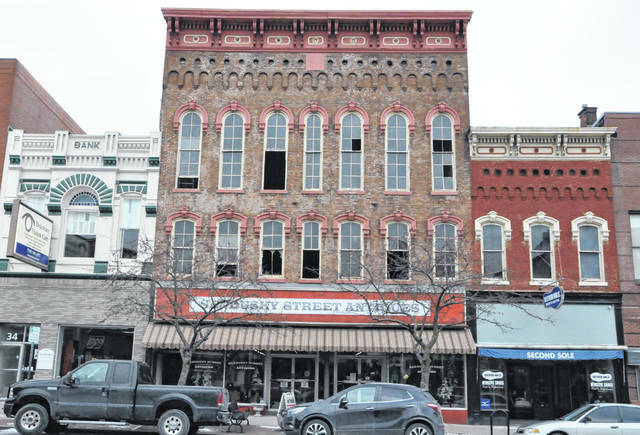 Developer Jim Manos, the owner of Manos Properties, is currently renovating the space above Sandusky Street Antiques to turn the second and third floors into high-end housing options that will be named the Sandusky Street Lofts. Located at 30 N. Sandusky St., the lofts will include four two-bedroom, two three-bedroom, and two one-bedroom units. Manos said the lofts will include many different architectural features, including high ceilings, exposed brick, and original flooring and windows, as well as an open floor plan. According to Manos, the third floor of the building once served as a ballroom for Delaware’s Knights of Pythias chapter. Manos is currently working on the renovation of the Perkins House on West William Street and the addition of the Wesleyan Inn hotel to the historic home. He also owns and has created downtown living spaces above the Delaware Area Chamber of Commerce office, Delaware County Convention and Visitors Bureau office, and J. Gumbo’s restaurant. He said he hopes to capture a vibe similar to that of the Short North area in Columbus with these new lofts. Perhaps the biggest selling point for the Sandusky Street Lofts will be the 18 parking spots located behind the building. Currently, Manos is renting that parking to the city, but those spots will ultimately be used for tenants once the project is finished. The building includes a walk-through that provides access to both Sandusky Street and the parking lot in the back. “I think it’s really good for Downtown Delaware, and I’m very excited to do it,” Manos said of the project, which he believes will enhance the living experience downtown. Manos said he has been working closely with Chief Building Official Jerry Warner as well as Planning and Community Development Director Dave Efland to ensure the project becomes a true asset to the community. Asked when he expects the project to be completed, Manos said he plans to begin pre-leasing and showing the lofts in March, with hopes for occupancy around June.